Tips and tricks on using Microsoft Expression Blend for software development, prototyping and working with customers. I'm speaking at TechDays Ottawa on how Expression Blend can help build prototypes that can be re-used later in the development process. It's a TurboTalk - which means take a huge topic and compress it into twenty (20) minutes. That said, there is another session by Anthony Hooper on Putting Expression Blend into Practice. So my session has turned into 5 Top reasons to use Expression Blend. Whether you're a designer or a developer, working in Expression Blend lets you design the visual elements of a screen or control quickly and easily, without any previous knowledge of XAML, which are the foundations for WPF and Silverlight. So if you're a WinForms developer looking for a way to get into these technologies, Expression Blend is a way of starting to plan out an application. Some people prefer to have their prototypes or mock-ups look very much like sketches so users don't get the wrong idea. Expression Blend lets developers apply styles to create that precise look and feel. No application is made up of one screen so it's important to show the workflow. In Blend, you can create navigation by linking screens directly in the Sketchflow map or by adding navigation behavior to a control. There's no coding involved, although if you want to add more details, you certainly can. One of the up-shots of Expression Blend is that when working in a production environment, a designer can work on the visual elements of a screen while the developer works on the code. With SketchFlow, you can show the users how the screens will work together. The SketchFlow Map shows how users can navigate through the mock-up. Even when building a web application, there will always be elements that are repeated. Let's look at Menus. Once a menu has been built, it can be turned into a component or sub-control that can be re-used on other screens. When you need to make a change, you only make it in the original sub-control. If you want to re-use an entire screen, you can convert it into a component screen so all of the prototype looks the same. There may be types of controls that need to replicate common functionality, like a dialog or a login control. Blend provides mock-up controls that replicate the look and feel of commonly used tools. This can make it easier to describe a scenario for users. 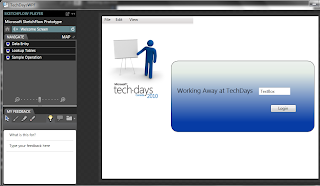 Mock-up controls include a variety of dialogs, the desktop, web browsers, individual controls and cursors. On every screen, you can add annotations that can appear when the project is run. The entire SketchFlow project can be exported to Word or PowerPoint with screen shots and annotations so the process can be documented. But more importantly, the entire process can be put into a SketchFlow package, which is a "runnable" executable where users can draw and add their own feedback to the package and then send those comments via email. The executable works and feels just like the running project so users can actually get a feel for how the process will work. There's a lot of specifics that couldn't be covered in the session, including putting data into the controls through either components. That's why it's great that another session on putting Expression Blend into practice is part of TechDays. For developers, Expression Blend works well for building some sample screens - and since an Expression Blend project can be opened directly in Visual Studio, the work that was done for showing the client what it could look like can be used as the base for the full product later on.